Will big Gerry be playing or will he be too busy feeding the homeless down at his local food bank? Don't think he lives anywhere near St Ninians. Vintage end of season stuff. Incredibly boring. Next. Agree - 0-0 was a fair result. Some good players missing for us...….Ross, Danny, Dylan and Neil. Felt we had more chances than Queens but could not put the ball in the net, not a bad result considering we had a number of injuries to starting players. Onwards to the Elgin game and hopefully a home win to make sure we can at least finish 5th this season. 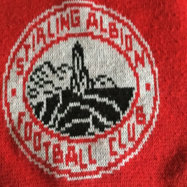 I think Stirling missed their chances much better than we missed ours. Thought we started brightly, then faded to blandness. highlights were seeing Gerry head the ball the length of the pitch, and seeing the oldies on the south stand fearing broken bones from the Stirling clearance which hit row ZZ early in the first half. Michael Ruth looked impressive in the few touches he managed when he came on. We looked a bit more menacing in the last 20 minutes with Kurtis Roberts' run the highlight, but once again, the lack of a cutting edge cost us. How McDonald avoided a booking for that tackle that forced McGrory to come off is a mystery. Or the linesman flagging for offside from a shy? Probably more people than know what a stoat-up is. Next missed chance the winner.